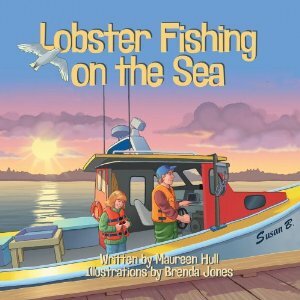 This picture book tells the story of Susan who goes lobster fishing with her father and hopes to catch a blue lobster. Early in the morning, Susan and her father set out to check their trawls. The father and daughter catch lobster and rock crabs, but they also catch other forms of sea life which are abundant in the Northumberland Strait. After catching starfish, hermit crabs, sculpin, rock eels and lumpfish, Susan releases them back into the ocean. While they never catch the elusive blue lobster, Susan and her father return to sell their catch on the wharf and enjoy lobster chowder for supper. Brenda Jones’s high-saturation, colour illustrations depict each scene, but also provide individual pictures for each creature discussed in the text. Maureen Hill lives on Pictou Island, Nova Scotia, and Brenda Jones lives in Prince Edward Island.